Instructor – Walt Kuehner, 2nd. Lt., Graduated from Moody Field Ga., B-24 Pilot. He assembled a crew at Boise, Ida. Then the war was over and he was discharged. He graduated from Moody Field, Ga. S/N: O-837442. Major, Served as B-29 Instructor. He had a 21 year career in the Air Force. Student Officer: 1st Lt. Graduated Moody GA, O-448445. Retired as Colonel in 1970. He was awarded the Silver Star in 1950 for valor on the battlefield, in addition to the Bronze Star and Distinguished Flying Crosses. Graduated From Napier Field Dothan AL, S/N: T-66594. Instructor – Rochette. Basic at Cochran, Graduated from Moody, Ga. Checked out in B-29, Retired From Navy as Commander. Graduated from Moody Field, Tyndall Field and Westover Field. Was a B-24 pilot. Served in the Pacific and Japan. Click here for his bio (a PDF). Instructor – Snow White. Click here for a group picture. He enlisted in the Army in 1942. Graduated Napier Field, S/N: O-836965. Later he was in England with the Troop Carrier Command for 5 months. Then transferred to a fighter group in Europe, piloting a P-47 Thunderbolt in raids over Germany. From 1946 to 1949, he was a member of the Delaware Air National Guard. Died Jan. 19, 2004, age 79. Graduated Napier Field AL, S/N: O-836967. He was in the 7th Bomb Grp, 492 Bomb Sqdn. On Aug. 7, 1945, he was co-pilot in a C-47 that crashed in India. All 9 crew were killed (MACR #15563). See also FindAGrave. Enlisted December 14, 1942. Graduated from Moody Field, Ga. Graduated Moody GA, S/N: O-837454. He was still in the Air Force in 1944-1945, when he was involved in some sort of air accident. Col. Leonard F. Deist, who served 43 years with the Air Force and Air Force Reserve, died Friday (April 2, 1993) of cancer at his home in Edwardsville. He was 69. Col. Deist was born in Wood River. In World War II, he flew low-level B-29 bombing missions over Japan. In the Korean War, the Air Force recalled him to active duty. Later, he kept flying with the Air Force Reserve. At one point, he commanded the 445th Military Airlift Wing, flying C-141 Starlifters out of Norton Air Force Base, Calif.
Col. Deist wore the wings of a command pilot and had more than 7,500 hours of flight in his logbook. In civilian life, he worked for Standard Oil in Wood River and then for the Air Force at Scott Air Force Base. He held membership in the Reserve Officers Association. 1st. Lt., Instructor at Douglas was Gail Updike, Graduated from Moody Field, Ga., S/N: T-15852. He flew B-24s in the Pacific and was in Korea after WWII. Born September 23, 1924. Died January 30, 2012. Enlisted May 28, 1943 in Biloxi, Miss. Instructor at Douglas was Gail Updike. Click here for a group photo. Took Advanced at Napier Field at Douthan Ala. S/N: O-836971. He may have stayed in the service after the War because he is found in a flying accident Nov. 13, 1950 in a T6 (S/N: 42-44041) when he was in the 101 Fighter Group, 133 Fighter Sqdn stationed at Grenier AFB, NH. He Crashed Belly Landing due to Weather. Instructor at Douglas was Walt Kuehner. He graduated as a bombardier with the Class of 45-06 at San Angelo AAFd in Texas on March 29, 1945. Washed out at Douglas. 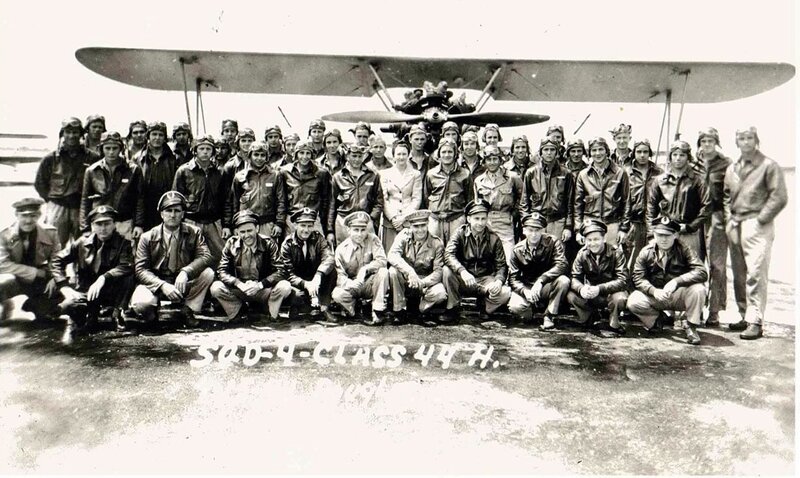 He graduated as a bombardier with the Class of 44-12 at Midland AAFd in Texas on September 2, 1944 and served with the 401st Bomb Group 613th Bomb Squadron in England. Probably born 1922 and enlisted from NJ (per enlistment records). Lt. Col., Graduated from Moody Field, Ga., S/N: O-837461. He served in the A.T.C. in the U.S.A. Flew B-24 and transports, died about 1986. Took Advanced at Napier Field at Douthan Ala. S/N: O-836975. He may have stayed in the air force after the War — a Col. Ray M. Foster was acting commander of the 349th Military Airlift Wing July 25 to Dec 1969, per Air Force Combat Wings History. Enlisted at Atlantic City Feb 21, 1943. He was assigned to the Pacific Theatre: Guam, Clarke Field, etc. Was First Flight Officer. Died Nov. 11, 1990 (Veterans’ Day), age 73. Graduated from Moody Field Ga, S/N: O-837463, Flew B-17 in British Guiana with a life boat strapped to the bottom for air-sea rescue duty. Served in the Army National Guard for 18 years after his 3-year stint in the Air Force. Wife- Mary Agnes Springer Gearhart. Graduated Moody GA, S/N: O-837465. 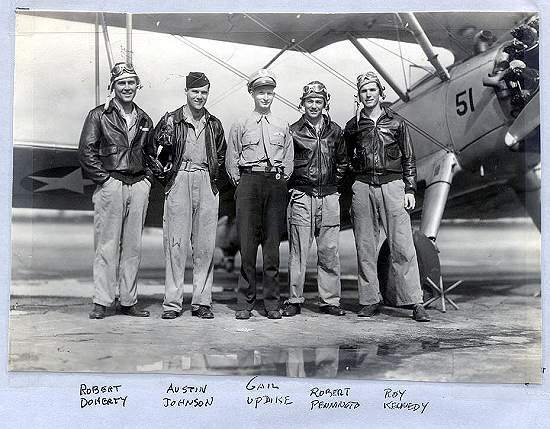 From his obituary [Salt Lake Tribune, The (UT) – Sunday, July 2, 2006]: "At the beginning of World War II he joined the Army Air Corps where he earned his wings. The war ended before he saw action. After that he moved to Utah to work at the Dugway Proving Grounds where he made many friends both civilian and servicemen." Graduated Moody GA, S/N: O-837467. Died May 18, 1999 Calverton, NY. From his obituary [Star-Ledger, The (Newark, NJ) – Saturday, May 17, 2003]: "He was an Army Pilot during W.W. II." Died May 16, 2003 Somerset, N.J.
From his obituary [Morning Call, The (Allentown, PA) – Monday, May 28, 2012]: He "was a WWII Army veteran". Died May 27, 2012 at Allentown, PA, Age 91, of Catasauqua. On Aug. 17, 1944 he had a landing accident in a AT-10 at Moody. Graduated from Moody GA, S/N: O-837470. Graduated from Moody, GA, S/N: O-837472. Died Apr. 20, 1992. 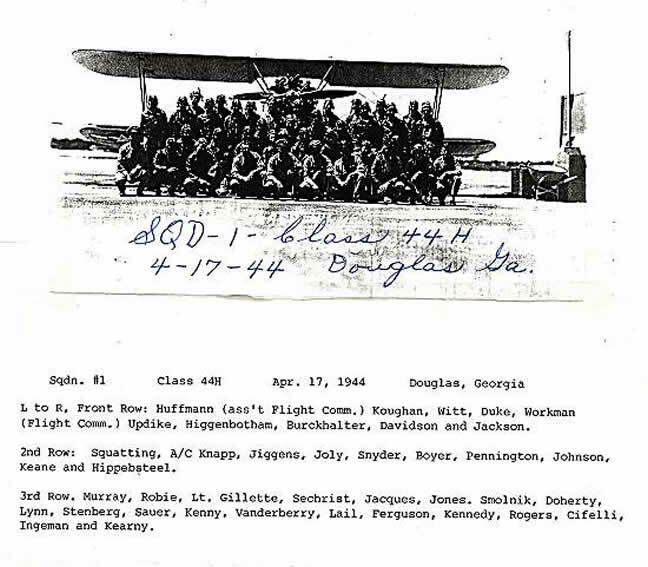 Instructor at Douglas was Mike Sullivan, Basic at Macon GA, Graduated from Moody GA, T-65863, flew B-17 and B-29, Discharged after the war, over 26,000 hours in Stearman aircraft as a cropduster. Click here for more info (PDF). S/N: O-837814. He was a B-29 co-pilot on the Osburn crew with the 500th Bomb Group 881st Bomb Squadron. From his obituary [Post and Courier, The (Charleston, SC) – Thursday, December 15, 2011]: He was a veteran of the United States Air Force for 32 years and was a pilot in World War II and Vietnam, where he received the purple heart. He ended his military career as the First Professor of Aerospace Studies at what is now Charleston Southern University. 2LT retired as Lt. Col.
Instructor at Douglas was Bill Toy, Basic at Macon GA, Washed out in Advanced Training, Transferred to Radar Observer Program. Graduated from Moody GA, S/N: O-837480. He was in the 380th Bomb Group, 529th Bomb Sqdn per http://380th.org/HISTORY/AbbreviatedRoster-All.htm#hhh . From FindAGrave obituary: "While serving with the Air Corps, he served as a co-pilot and made many flights to Okinawa, the Philippines and Korea, attaining the rank of 1st Lieutenant." Became a dentist after the War. and later was in the National Guard. He was recalled for the Korean War. 2nd. Lt., S/N: T-65869. Graduated from Moody GA, Co-pilot on B-29. From his obituary [Boston Herald (MA) – Monday, December 18, 2006]: "He enlisted with the Army Air Corps on April 13, 1943, and served as a B-29 bomber pilot in World War II. He was discharged as a second lieutenant on Dec. 7, 1945, with the ability to pilot commercial airplanes." Died Dec. 13, 2006, age 82. Graduated from Moody GA, S/N: O-837483. From his obituary [Owensboro Messenger-Inquirer (KY) – Tuesday, January 22, 2008]: "He left the university to enlist in the Army Air Corps where, as a second lieutenant, he piloted and instructed in B-24s during World War II." Graduated from Moody GA, S/N: O-837484. Became staff engineer, gas operations, with the Philadelphia Electric Company after the War (See http://www.nytimes.com/1981/05/17/style/leslie-g-rowland-wed-to-william-e-jacques.html). Graduated Moody Field AL, S/N: O-837489. Was in the 461st Bomb Group 764th Bomb Squadron when he was KIA 1945-04-25 (MACR #14058). 2nd. 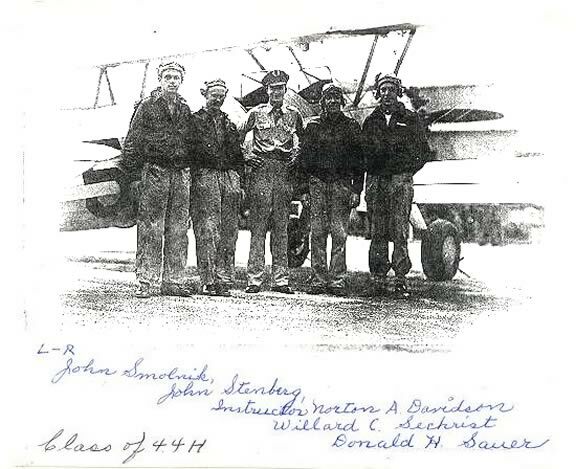 Lt., Basic at Macon GA, Graduated Napier Field AL, flew P-51s, S/N: O-836996. Capt., Graduated from Moody GA, flew B-17, B-25, and B-29, S/N: O-837490. Flew A.T.C., picking up planes in Bradley Field, England and flying them to Arizona for mothballing. Click here for a group photo. Capt., Instructor at Douglas was Bill Dillard, Instructed in contract flying schools for a period, S/N: O-837493. Graduated from Moody GA, S/N: O-837494. Was involved in a taxiing accident when in the 330th AAFBU on 9/1/1945 in a B-17 at Drew Field, FL. From his obituary on FindAGrave: "At the early age of 17 he joined the Army Air Corps during WW II. He trained and mastered the skills to become a P-51 fighter Pilot serving in the Pacific theater. While on a three day leave, prior to his deployment to Okinawa, he married his sweetheart and love of his life, Helen Loraine Fennell in Salinas, California on July 30, 1945. He was a proud and patriotic WWII veteran." Graduated from Moody GA, S/N: O-837499. From his obituary [http://currentobituary.com/Memory.aspx?Memory_ObitdID=82322]: "He served as a Lieutenant in the Army Air Corps during World War II, distinguishing himself as a B-24 bomber pilot." Died Aug. 5, 2010 age 85. A native of Brookline, MA, then of Wellesley. See FindAGrave: "A veteran of World War II, he retired as a Lieutenant Colonel, having served over forty years as a Judge Advocate with the Judge Advocate General Corps, United States Air Force." Graduated from Moody GA, S/N: O-837503. Per FindAGrave: He was on U.S. Air Force B-50D Superfortress #49-267, from the 342nd Bomb Squadron, 97th Bomb Group, Biggs Field, Texas, which stalled at 7,000 feet and crashed four miles northeast of Mason, Ohio, killing four officers and twelve enlisted men aboard. The plane was carrying a single nuclear bomb, without a fuel cell, which exploded upon impact, destroying most the aircraft and creating a 25 foot deep, 200 foot wide crater. The crew had parachutes, but there was no evidence any had a chance to bail out. One report stated the weather was clear, but another source said there was a thunderstorm at the time. One witness stated an engine was on fire. d. 07/13/1950, buried Fort Sam Houston National Cemetery. He graduated as a bombardier with the Class of 45-11 at Big Spring AAFd in Texas on May 3, 1945. Enlisted May 04, 1943 from Kings County, New York. Graduated from Moody GA, S/N: T-65884. After the War, it appears that he received his Bachelor’s degree and a Master’s of Arts from Cornell (See Cornell documents online). Enlisted 07-25-1942 from Harrisburg, PA. He graduated as a bombardier with the Class of 44-42 at Carlsbad AAFd in New Mexico on October 14, 1944 (S/N: O-788070) and served with the 491st Bomb Group 853rd Bomb Squadron. Instructor at Douglas was Gail Updike. From probably his obit at FindAGrave: "A pilot with the Army Air Corps during World War II, Pennington took advantage of the G.I. Bill and attended Penn State University, where he graduated with a Bachelor’s Degree in 1947." Click here for a group photo. Graduated from Moody GA, S/N: O-837525. 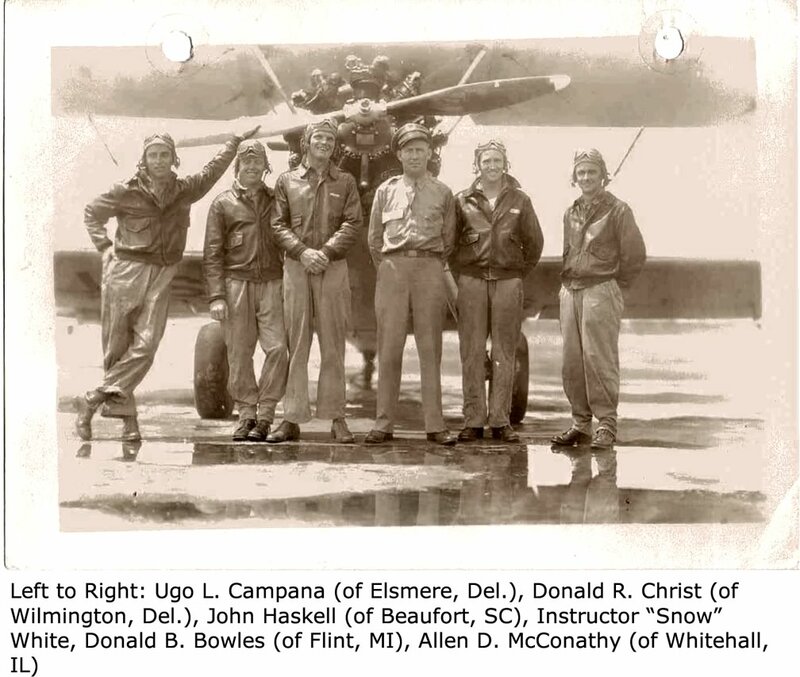 Was possibly in the 98th Bomb Group, since he is shown here as co-pilot with Buell Crider pilot. Is likely the author of State of the Nathan: The True Story of My Life’s Adventures, 2003. Possibly the same Robert Rakofsky as S/N: O-837041, a co-pilot, who died not in battle while in the 54th Troop Carrier Sqdn, when a C-47 (S/N: 43-48893) crashed at Elmendorf Field, Alaska. Four crew members were killed, according to the report (MACR p. 13681). Instructor at Douglas was Fred Briles. From probably his obituary [Republican-American (Waterbury, CT) – Monday, March 3, 2008]: "He was a veteran of World War II, serving with the Army Air Force." Died March 15, 2002, age 79. From his obituary [Hartford Courant, The (CT) – Tuesday, May 18, 1999]: "served in the U.S. Air Force during World War II and lived in Simsbury for 45 years." Graduated as a navigator with the Class of 44-51N at San Marcos AAFd in Texas on December 15, 1944 (S/N: O-2079129) and served with the 040th Bomb Group 044th Bomb Squadron (VHB) in the Mariannas. His instructor at Douglas was Sandy Davidson – Click here for a group picture. 1st. Lt., Instructors at Douglas were Sandy Davidson and Hayne Workman. Click here for a group picture. Instructor at Douglas was Sandy Davidson. Graduated from Moody GA, S/N: O-837576. He was a B-29 pilot with the 462nd Bomb Group 768th Bomb Sqdn. From his obituary [Virginian-Pilot, The (Norfolk, VA) – Sunday, November 26, 2000]: he was buried at "Arlington National Cemetery with full military honors." Click here for his photo. Enlisted May 26, 1942. 1st. Lt.